A great week 11 of the 2012 college football season is in the books and we finally saw the number one team in the nation, Alabama, go down in defeat! Facing a tough task against the newest member of the SEC, Texas A&M, the Crimson Tide fell short to the Aggies, 29-24, after they intercepted their second A.J. McCarron pass of the game on 4th & Goal with under a 2:00 minutes to play in the end zone. McCarron hadn’t thrown an INT all year but threw two in this game and that’s what appeared to be the difference. Alabama is no longer undefeated and we are left with three undefeated teams now and perhaps a clearer picture as to what two teams will be playing in the BCS National Championship game. The first undefeated team, Kansas State, defeated TCU 23-10. The second undefeated team, Oregon, blew out California 59-17. And finally, the third and final undefeated team, Notre Dame, defeated Boston College 21-6. So now only three undefeated teams remain, and each team has two remaining games, so there is still time for one more team to slip up and lose so there is hopefully no controversy as to which two teams should play in the title game. Anyway, let’s get to this weeks standings, shall we? 1.Kansas State Wildcats (10-0) defeated TCU Horned Frogs 23-10. Last Week (2). 2.Oregon Ducks (10-0) defeated California Bears 59-17. Last Week (3). 3.Notre Dame Fighting Irish (10-0) defeated Boston College Eagles 21-6. Last Week (4). 4.Georgia Bulldogs (9-1) defeated Auburn Tigers 38-0. Last Week (5). 5,Alabama Crimson Tide (9-1) lost to Texas A&M Aggies 29-24. Last Week (1). 6.Florida Gators (9-1) defeated Louisiana Lafayette Ragin’ Cajuns 27-20. Last Week (6). 7.Florida State Seminoles (9-1) defeated Virginia Tech Hokies 28-22. Last Week (8). 8.South Carolina Gamecocks (8-2) defeated Arkansas Razorbacks 38-20. Last Week (9). 9.LSU Tigers (8-2) defeated Mississippi State Bulldogs 37-17. Last Week (10). 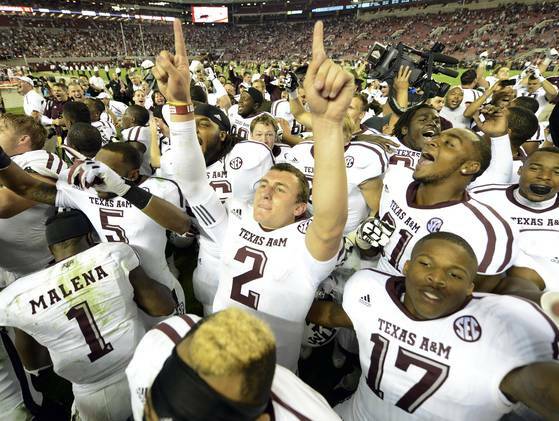 10.Texas A&M Aggies (8-2) defeated #1 Alabama Crimson Tide 29-24. Last Week (N/R). Heisman Trophy: Johnny Manziel, QB, Texas A&M – This Week: 24 of 31, 253 yards passing, 2 TD’s, 0 INT’s, 18 carries, 92 yards, defeated #1 Alabama Crimson Tide 29-24. This year: 2,780 yards passing, 18 TD passes, 6 INT’s, 67.6% Completion Percentage, 156 carries, 1,014 yards, 15 TD’s. This entry was posted on November 12, 2012 by stevep. It was filed under Uncategorized .